It’s in human nature to look for something engaging during their free time. Something both fun and exciting. Gambling is one of many activities that adults decide to go for, not only as a hobby but also as an extra way of making money. By reviewing Bitcasino.io, we will help you learn whether it is a good choice of an online gambling platform or not. By going through all of the website’s attributes, we will determine together if betting on their site is worth it. So without further ado let’s jump right into the Bitcasino.io review and discover what the Bitcoin-only casino has to offer. This Bitcoin-only casino is owned and operated by Luckbox Ent. Ltd. and was established back in 2014 under the license and regulation by the government of Curacao. The site offers a wide selection of games, part of many different categories. By that alone, you can see that no matter which games you prefer, finding some you like won’t be a problem. Their bonuses are also great, but we will talk about that later. For now, let’s take a look at their gaming library. The website’s main menu bar is divided into five different pages. Games, Live Casino, VIP, Promotions, and finally Sportsbook. First, let’s talk about the highlight of their website. Slots that is. It has been more than two minutes scrolling down their slot page, and the games won’t stop loading in. We aren’t exaggerating. There have to be at least 700-800 slot games available on the site. And don’t you think that they all are right there in front of you just to make you have a good opinion about Bitcasino.io. They are all top quality slot games. In fact, they are provided by top leading industry experts such as ISoftbet, Quickfire, Netent, Betsoft, Quickspin and most other major ones. So as it was expected, you will find most of the favourite slot games such as Starburst, Fruit Zen, Gonzo’s Quest, Booming Bananas and many others. As for table games, all of them like Blackjack, Baccarat, Poker and other are offered each with many different variations available. On the Blackjack section, you will find 65 titles including classic blackjack, Pontoon, Spanish 21, Hi-Lo, Double exposure and many others along with a plethora of variations. On Baccarat’s section, you will find more than 20 titles. The regular Baccarat, as well as low and high limit variations together with a mini-Baccarat game, are offered. Of course, Punto Banco variations couldn’t be missing from this list. In addition to these, there are also ten live Baccarat games you can play. On the Roulette section, you will find more than 25 games of all kinds such as the European Roulette, French Roulette, American Roulette as well as another six live Roulette games available to play. As for other table games such as craps and Poker, you will not be disappointed as there are multiple titles to choose from, too. 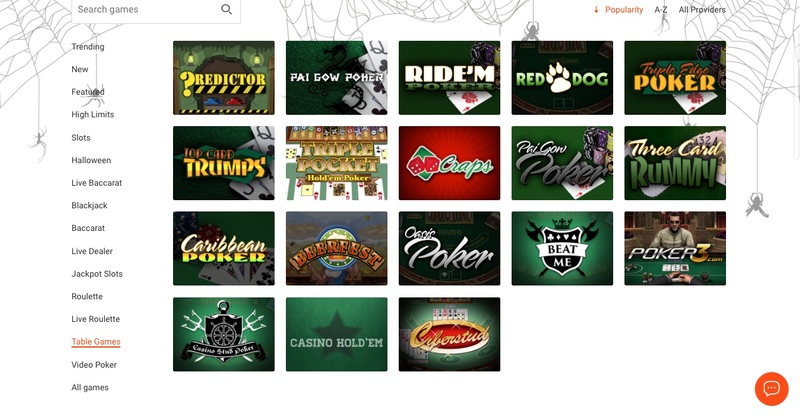 To be honest if you like Video Poker you will love their site as they offer 79 different Video Poker games. Yes, Bitcasino.io offers a Sportsbook option as well. There you will find many different sporting events you can place bets. Lost for words? Don’t worry; we feel just the same as you do. Have we told you about all the different software providers Bitcasino.io is partnered with? Guess what. Some of them host their live casino rooms on the website. Five different ones to be exact. These come from Evolution Gaming, Asia Gaming, Ezugi, Netent, and Quickfire. 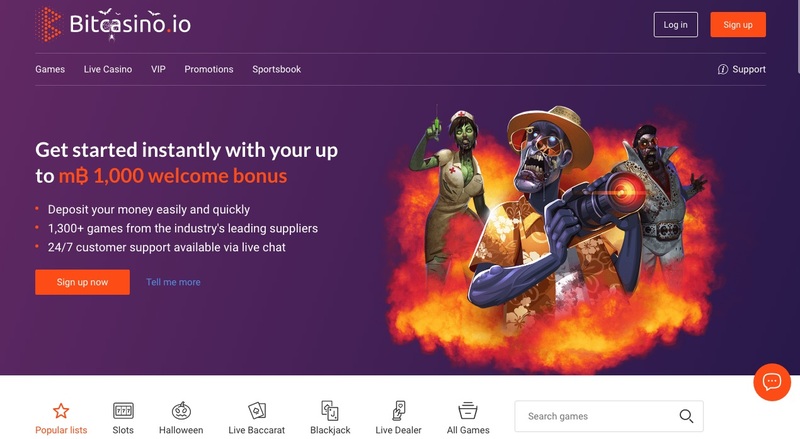 Each features its selection of games and supported languages so if you talk English, Spanish, or Chinese then you should be good to go and start betting on those live casinos. You can expect to find all the regular live games such as Blackjack, Roulette, Baccarat, and Poker along with many of their famous variations. Just like in everything else, this online casino excels one more when it comes to their customer support. You can either contact them via email or live chat. They are online 24/7 and their response times are rapid. For your most queries, though, there is a high chance that your question has already been answered before. You can check their FAQ section for more information on any problems you may experience. Bitcasino.io is a Bitcoin-only casino so the only viable deposit and withdrawal methods must be carried out using this specific cryptocurrency. Both deposit and withdrawal shouldn’t take long because Bitcoin is a very quickly processed unit. The minimum deposit amount is only 1mBTC while there isn’t a maximum one set. The online casino doesn’t encourage you, though, to deposit large amounts of money as they want you to “play responsibly and within your allocated means” as they state themselves. The minimum withdrawal amount is just 2mBTC. You can withdraw as much as 50BTC per day. Although if the withdrawn amount exceeds 1BTC, they have the right to carry out an additional verification process. No matter the amount you withdraw, three confirmations should be applied. However, the transaction fees, provided they do exist, are not stated somewhere on the site. They only say that transaction fees are minimal when it comes to Bitcoin transactions. Although most probably you would have to message them personally to find out about their specific transaction fees. The first deposit awards you a 100% bonus up to 1BTC which you have to wager at least 35 times over the course of 30 days to become eligible for withdrawal. The downside is that only the money bet on slots is accounted on the minimum wage requirement. The second deposit offers a 50% bonus up to 1BTC which this time has to be wagered only 30 times but still once again over the course of 30 days. But the fun doesn’t stop there as every time you deposit money you get a 25% reload bonus which you have to wager 30 times. Again over the course of 30 days. Promotions come and go on Bitcasino.io all the time. For example, at the time this article is being written, there is an active promotion for the “Immortal Romance” slot game. If you deposit and play mBTC 10+, you get ten free spins. For deposits of mBTC 50+ and 100+, you will be awarded 50 and 100 free spins respectively. There is also a VIP program with various rewards. Apart from the usual free spins and Bitcoin gift vouchers you can even get an Apple iPhone X, a MacBook Pro, and a Samsung TV! Not all games on the online casino’s website can be accessed through your tablet or smartphone. However, as time goes by, the selection of mobile games is growing at a relatively rapid pace. The casino doesn’t have a designated mobile app but it has a mobile-friendly website. We would say that it is an excellent option for anyone who isn’t afraid of playing using Bitcoin as his desired form of currency, or cryptocurrency to be more exact. Either you are a new player or an old timer on the online gambling world Bitcasino’s wide selection of games has to offer something you like for sure. As for their selection of games, there is something available for anyone, so we will give them a 5/5 in that section. Their customer service is excellent, and reviews from players on the Internet are mostly positive, so they get a 5/5 in that category too. Now, they may be a Bitcoin-only casino, but we would like to see some more deposit methods on that front they get a 4/5. They are mobile friendly, but the available games are still only a few compared to what the browser edition of the online casino offers. So they get a 3/5 for that. Finally, their bonuses are great but not perfect. We would like to have the ability to withdraw the percentage of the bonus we have already cleared of. So for that, they get 4/5. After considering all five ratings, the general rank of the site is a very strong 4.4/5. Bitcasino.io is one of the best Bitcoin-only gambling sites on the Internet with a vast selection of over 1300 games to choose from. Their website is mobile-friendly and load fast with beautiful graphics but still a simple and elegant interface. You can’t go wrong if you choose to play on their platform as it can be challenging to find one other Bitcoin-only online casino that is better than them from an all-in-one perspective. It’s also a great place to start gambling with Bitcoin.